Nandi Hills distance from Bangalore is around 70kms. 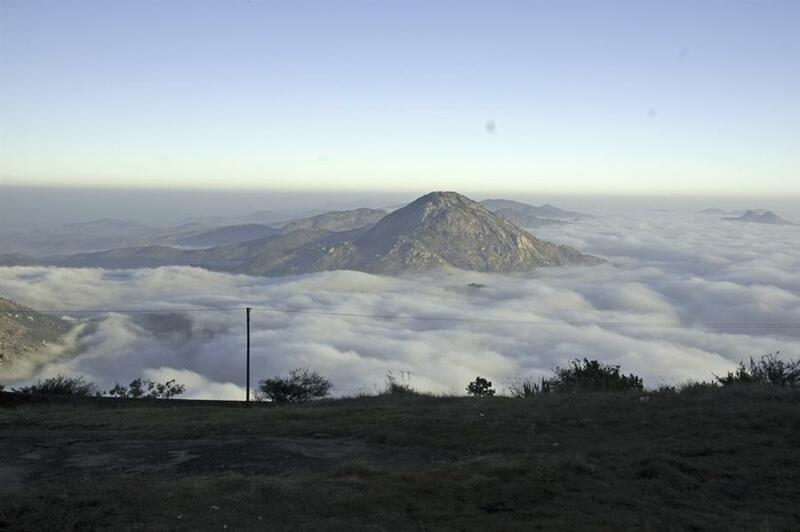 Nandi Hills altitude is 1457 metres above mean sea level (MSL). This is one of the best hill station near Bengaluru. The hill station is locally called as Nandi Betta or Nandidurg. There are 2 restaurants at the top of the Nandi hills. One is a decent one operated by K.S.T.D.C. (Karnataka State Tourist Development Corporation). It is a non veg restaurant with limited options. Their menu showed a lot of items, but when we tried to order, their answer was "sorry, we do not serve that item at this time". (I believe their answer is going to be pretty much same any time of the day or year). Read Tips for visitors to Nandi Hill, Bengaluru. The Nandi Hills restaurant was pretty clean and well maintained. One side of the restaurant has a glass wall offering a very good view to the side of the hill and a beautiful garden below. All items are reasonably priced. Most of the vegetarian dishes are about Rs 70 price range and non vegetarian items are about Rs 90 to Rs 150. Unfortunately, the food doesn't taste as good as the price. We ordered butter chicken, chilli chicken and chicken fried rice and unfortunately they did not come up to my expectation. We regretted not filling our stomachs before driving to the Nandhi Hills. There is another vegetarian restaurant in Nandi Hills top, which did not look hygienic at all from an outside view. Even the name board of the restaurant looked rusted and unclean. We did not bother to look inside. There are few coffee shops and snack bars on the top of the Nandhi Hills. We really enjoyed the masala tea in the tea shop in front the KSTDC restaurant. It was funny to watch our kids repeatedly asking for more and more masala Tea, including our 1 year old baby boy! If you are looking for very tasty food, you may want to try other options outside the hill station. There are few private restaurants on the foot hills of Nandi Hills in Bangalore and they looked very clean and good. We did not taste the food, so I will leave it to you try and give your comments. If you ever ate the food at any restaurants around the Nandi Hills area, please post your experience as comments below. There are many Hill Stations near Bangalore like BR Hills, Kolli Hills and Horsely Hills around 200kms radius - that is what makes Bengaluru an attractive tourist place.